This hole is named after Bobby Leigh who caddied for Peter Thompson from aged 17 until he finished, he also caddied for Greg Norman. Look straight ahead for the flag. BLOCK TEE, TEE BOARD are at the same place. WHITE TEE varies on the back teeing area. A ditch runs across the fairway usually well short of even a short drive. A long drive can reach the fairway bunkers 100yds from the Green. 20yds in front of the short cross fairway ditch. On the right is a mound that is continually G.U.R. It runs from 200yds to 120yds to the green – free drop area. On the right side from right fairway bunker running to past the green is a ditch. Behind the trees on the left is a ditch. 2 fairway left/right bunkers are 100yds from the green centre. 2 front left/right green bunkers. Provided you stay on the fairway the approach to the green is relatively straight forward. 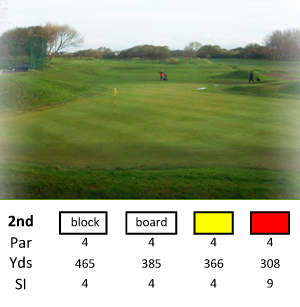 The green is flat with a slight mound towards the front – a favourite place for the hole. There are two memorial headstones placed at the back-right of the green in memory of some of our past members. From the tee look straight ahead for the flag. BLOCK TEE is on the raised tee area 80yds behind the TEE BOARD. From the Back Raised Block Tee the trees/bushes on the left and the ditch on the right that runs up to the RED TEE can prove dangerous to the off-line drive. 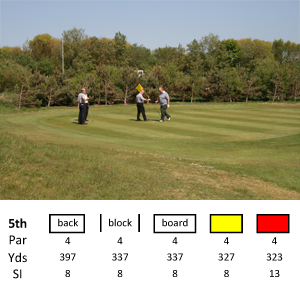 TEE BOARD – WHITE TEE varies on the teeing area. The long drive can reach the ditch (140yds from the Green) – make sure to play short unless you know you can clear the ditch. 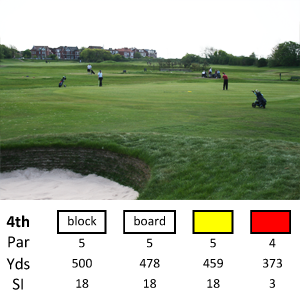 The cross fairway ditch comes into play – you need to decide to play short, go over the ditch or draw you ball to the far left. This tee is towards the front of the right-hand ditch. The cross-fairway ditch should not trouble the drive. To the LEFT you find a coppice, a rough mound (at 175 to 150yds from the green) and over these a ditch that runs all the way down the left. For all drives, the mound on the right is continually G.U.R. Watch for the curved ditch that runs across the fairway at 130yds from the green. Beware of going long and RIGHT the TREES cut you off from the Green. 60yds from the green on the left is a ditch that cuts across from the left ditch towards the fairway into the semi-rough. Green Bunkers: 2 front – 1 left & 1 right. The best option is to aim for the foot bridge in the middle of the fairway and keep it ‘straight down the middle’, either clear the ditch or lay-up. This hole is named after the 3 trees on the right of the fairway some 140yds from the green – the 3 Sisters. From the tee look straight ahead for the flag beyond the trees on the far right. This tee is on the raised tee area with the tall fencing immediately to the right. 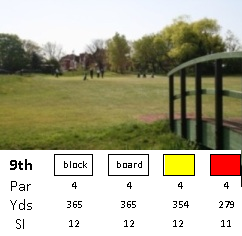 TEE BOARD – WHITE TEE the latter varies across the teeing area. This tee is just in front of the Block Tee with trees to the right. This tee is usually towards the centre of the teeing area, shortly before the ditch that runs across the fairway. This tee is just over the ditch in the centre of the fairway. To the LEFT a ditch runs for 300yds. On the RIGHT at 140yds from the green the trees cut into the fairway. Just passed these trees a ditch runs diagonally forward half way across the fairway and can catch a well hit 2nd shot. Behind the green is a pond. 1 right fairway bunker 300yds from the green. 2 bunkers left & right protect the front of the green. 1 back left bunker sits just behind the 1st left bunker. The best option is to aim slightly right towards the right fairway bunker. The left semi-rough cuts into the fairway so keep slightly right. The green is flat except for a slight up slope at the front towards the middle. This hole is named after the WOODEN WALL that blocks off the view of the green from the tee and fairway. A marker post shows the green position. When you are close to the fairway bunkers (just in front of the WALL) move to either side to see the flag position and distance. From the tee you will see, straight ahead, the two bunkers and WALL. BLOCK TEE is at the back of the teeing area 22yds behind the TEE BOARD. These tees are at the front of the teeing area. This tee is well forward to the right of the pond. This tee is well forward where the 2 paths to the left meet. At about drive distance (for most) are 2 ditches just off the fairway (left and right). The 150yd marker is hidden by a small bush on the right side. On the right side of the fairway, short of the WALL, is a diagonal ditch in front of the rough mound. This runs from the green passage-way towards the WALL. 2 right-side bunkers that can be reached from the tee with a long drive. 2 bunkers in front of the wall mound to catch your 2nd shot. 1 right-sided bunker some 30yds passed the WALL. Now decide whether to carry the wall or lay-up. On the horizon you can see the Hesketh GC Clock Tower from which it gets its name. The hole slightly dog-legs to the right. This is on a tee mound some 60yds behind the Tee Board, it is used for some Competitions. This tee is on the main teeing area. This tee is at the front of the teeing area. This raised tee to the left of the main teeing area. At about drive distance (for most) are 2 ditches just off the fairway (left and right) and a coppice that loves to swallow drives. For some the pond on the left (120yds from the green) proves a hazard for the drive. 2 deep bunkers left and right to the green entrance in front of the mounds. 2 mid-green bunkers – left and right. 1 left back green bunker. From the tee area go to the left to see where the flag is placed on the green, if left keep your drive right-centre, if right keep it left-centre. The trees on the right (150yds from the green) can be cleared by a long drive. 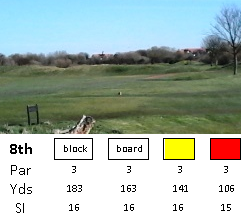 A straight drive for the Hesketh clock tower pays dividends. This hole is named after one of our past members, Jack Carr, who lived in the bungalow over looking the hole. Straight ahead you can see the flag. BLOCK TEE/WHITE TEE is at the back of the raised teeing area. This tee is to the right next to fencing on a slightly raised area. This tee is close to the tee board. This tee is in front of the tee board. The pond on the left loves short hit balls. You can see most of the trouble. Straight drive at the flag. Be aware of the wind – you need to allow for its direction and strength. 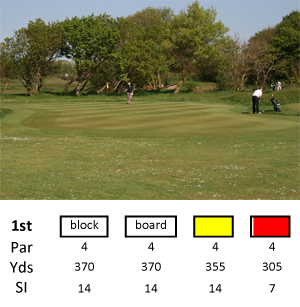 The green slopes from front, short left and right towards the fairway with the centre and back green almost level. This hole is named after a local doctor, Dr Findlay, who, in the early 1900s, persuaded the Southport Urban District Council that Southport needed a Municipal Golf Course . From the tee you can just see the tee from the raised tees, a straight hole where your drive needs to be as close as possible to the mound in the centre of the fairway (150yds from the green). Is at the back of the raised teeing area to the right of the bushes. This tee is on the level next to the bushes. Optionally the White tee is on the left raised tee. This tee on the first level of the raised tee area at the sea-side of the bushes to the right of the tee board. There is a ditch on the right running up to the central mound 150yds from the green. OUT-OF-BOUNDS is marked all along the right side of the fairway up to the green. 2 fairway bunkers (left – right) at 100yds from the green. 2 front green bunkers – left & right. 1 right hidden rear bunker. Straight drive towards the flag. The green tends to slope from back right to front left. This hole is named after Teddy Halsall, a past member of our club, who caddied for Johnny Miller. This is a straight par 3 with the bottom of the flag hidden over the mound. Is on the raised teeing area. These tees are on the slight raised tee. This tee is further forward of the tee board. 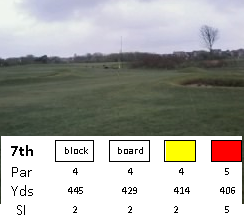 The green cannot be seen from the tees. Right of the green a ditch runs diagonally right to further right to the back of the green. Both left & right the greenside mounds can deflect your ball to the left/right & and right/left. Too far right the mound kicks your ball into the ditch. 2 greenside bunkers – 1 front left & 1 back left. 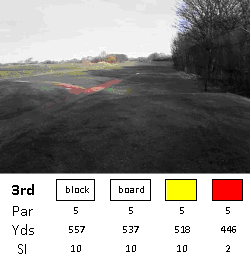 Straight drive is preferred, usually towards the large tree behind the green. Make sure you take enough club the length is deceptive. The green is nearly flat. This hole is named after Monet’s famous painting. From the tee look straight ahead – the ground rises from the cross fairway ditch to the green. The three tees are at the tee board. This tee is on the other side of the ditch that runs across the hole to the right of the fairway. A ditch runs all along the right side of the fairway. With a short drive you may have to lay up to before the far ditch that runs across the fairway at 75yds from the green. 1 greenside bunker – back right. The green has two tiers – front sloping up to the middle. 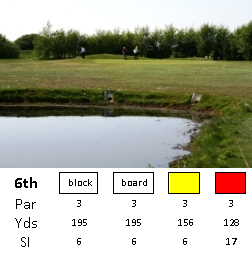 The green is slightly higher than the fairway and may require some adjustment in the club you select on your approach.